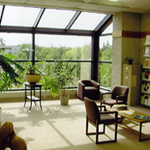 Brandon University School of Music is located in the spacious Queen Elizabeth II Music Building, which is one of the finest facilities of its kind on the continent. Officially opened in 1990, the building contains 30 practice studios, 30 teaching studios, 3 classrooms, a seminar room, faculty and student lounges, computer music laboratory, electronic music studio, organ studio, percussion studio, collegium studio, recital hall, artists’ green room, main office and dean’s office. 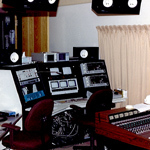 The building houses over 60 pianos as well as state-of-the-art computer hardware, software and recording equipment. The 200-seat Lorne Watson Recital Hall is magnificent. Sophisticated acoustic treatments include a motorized stage canopy, reversible stage panels, and motorized acoustic drapes. The backstage facilities include a professional electronic lighting board, a television monitor for remote stage viewing, and telephone links to the Media Room and Green Room. The recital hall is equipped with Steinway and Baldwin grand pianos and is the site of many high-profile events including CBC broadcasts and the Eckhardt-Gramatté National Music Competition. 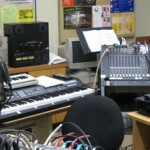 The Electronic Music Studio features sophisticated technology for electronic music composition and professional audio recording. 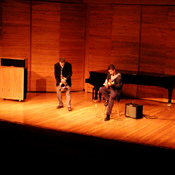 The Media Room is located on the second floor of the Queen Elizabeth II Music Building, overlooking the Lorne Watson Recital Hall, but also has recording capabilities linked to the R.D. Bell Hall, and the Kinsmen Rehearsal Hall. The Mary Smart Organ Studio houses a custom-designed tracker organ by Gabriel Kney. 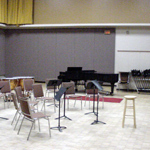 The Kinsmen Rehearsal Hall provides ample rehearsal space for large ensembles. Both R. D. Bell and the Kinsmen Rehearsal Hall are electronically linked with the Media Room to facilitate both audio and video recording. The R. D. Bell Hall is ideal for both lectures and choral rehearsals. Both R. D. Bell and the Kinsmen Rehearsal Hall are electronically linked with the Media Room to facilitate both audio and video recording. The Music Library contains extensive holdings that are easily accessible through a computerized cataloguing system that is linked to the main library. There are ample audio and video monitoring stations for student use.